If you've become the target of abusive activity or are seeing it take place in a discussion or profile powered by Disqus, there are a few things you can do to raise awareness of the issue to the right people, and hopefully, find a resolution. Ask yourself, is this user breaking the Basic Rules? Note: Offensive content is tolerated and Disqus does not moderate individual comments, that is the responsibility of site moderators. Disqus takes action on the most extreme reports in which the Terms of Service have been violated. 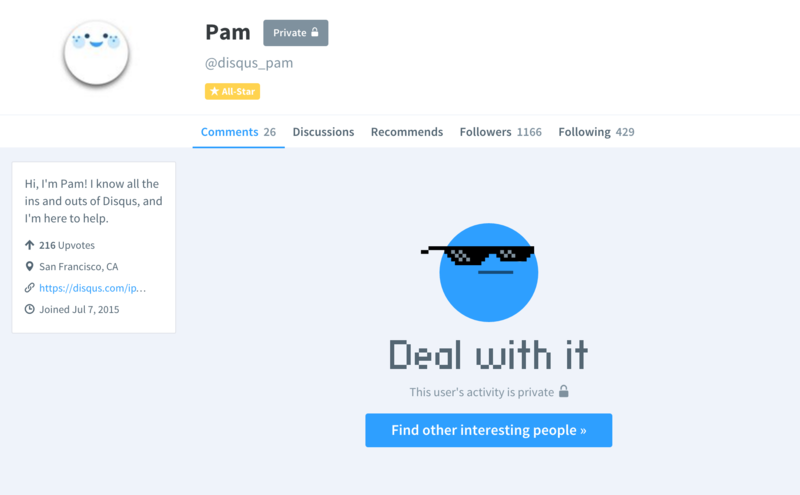 Disqus does not mediate content or intervene in disputes between users. What Happens After Reporting a User? User Reporting is incorporated into reputation scores and helps site moderators make better decisions about who to remove from their community. Moderation decisions are made by site moderators, not Disqus. If you've picked up an unwanted follower that's bothering you across multiple sites, you can make your profile activity private to prevent all other users from being able to follow you or see your comments in your profile; this can help isolate issues with certain people to certain communities. If they already follow you, you can remove them and/or block them. If you or someone you care about is experiencing cyber harassment online, please seek out additional resources such as ReachOut as well as reporting to site moderators and Disqus. If you encounter a direct threat of suicide or self-harm on Disqus, visit How to report threats of suicide or self-harm. If you feel a crime has been committed or a credible threat has been made against you or someone else via Disqus, please contact your local law enforcement in addition to reporting the user to Disqus.